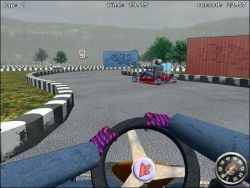 The object of BMX Racer is to ride your BMX through the countryside from a top down perspective. 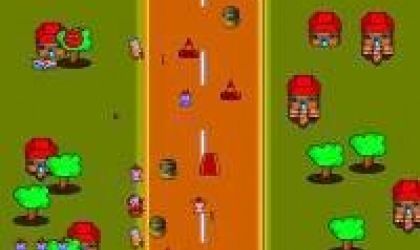 Along the way you will have to avoid obstacles in the road such as cars, pot-holes, pedestrians throwing objects as well as other BMX racers. 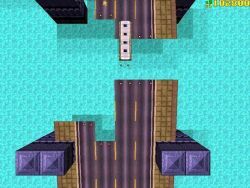 There are also ramps in the road where you can speed up and ramp over cars, destroying them if you hit them from above. I had to give it 40% because it was a little bit boring and there wasn't as much action as in other racing car games that I have played before. I think this game has been designed by someone with a massive experience in the field. This game is very good for relaxation and stress relief. I have not played such a boring and anti-action game before. Is it a master stupid game or a baby game? Dont even bother to download this game. Like naffy said, the worst thing ever!